In 1953, the Oregon State Beavers debuted a new football facility, Parker Stadium, and just a few years later, in 1956, the Beavs reached the Rose Bowl. The Ducks were still playing their home football games either at Hayward Field or at Multnomah Stadium in Portland, a commute not enjoyed by Coach Casanova. This led to talk of a new stadium for the UO. Trips to the 1960 Liberty Bowl and the 1963 Sun Bowl gave “Cas” the bankroll to start planning in earnest. My dad, Marshall O. Bessonette, was both a contractor and an avid Ducks fan, and he volunteered to conduct research on the new stadium at his own expense. He and his good friend Leo Harris (then UO athletics director) began traveling across the country to visit college stadiums. A couple of times I heard my father interviewed in the press box of some distant stadium, as they watched games and took notes and photos. No matter where he was traveling, Marshall always took note of the design and construction of buildings. I remember him visiting me (now grown and with a family of my own) in Salt Lake City in the mid ’60s. Dad visited a construction site for a theater-in-the-round, where a large earthen bowl had been constructed with the intent of placing a stage at the bottom and covering it with a roof. 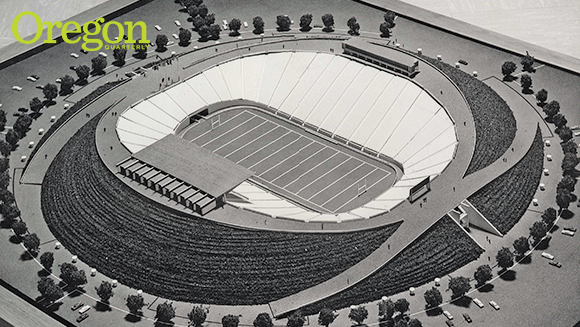 This, as I recall, prompted his idea for the bowl shape that became Autzen Stadium. Dad also designed a cantilevered roof for covering the reserved seating section, offering demonstrations with a hinged wooden ruler and a hammer, showing that the roof could be suspended with literally no anchor. He’d then laugh and say, “Of course, no engineer would approve of the ‘no anchor’ idea.” At one point he also advocated for putting parking spots on the bowl so that donors could watch the game from their cars. This was discarded as impractical, but Dad would remain a faithful tailgater throughout his years. The model and the ideas for the stadium, along with ideas for financing, were formally presented at a University of Oregon program attended by many dignitaries. Later, “Cas” Casanova and Leo Harris would travel the state trying to raise funds from donors using Marshall’s model as an important prop to demonstrate their ideas. The stadium, designed by Portland architectural firm Skidmore, Owings & Merrill, opened on September 23, 1967. Dad kept his seats on the 50-yard line even after his beloved wife, Joy, passed away, attending games until he couldn’t climb the steps to his seat. He passed in 1993. Nancy Bessonette worked in the insurance business in Eugene for many years. During that time, she volunteered in the UO ticket office and officiated at various track meets on campus. She is, of course, a lifelong Ducks fan.